A large crowd packed into the small white meeting house of Pilgrim Congregational Church at Harwich Port Sunday to hear the Cape Cod Chamber Orchestra. The young founding conductor Matthew Scinto has a vision for music at Cape Cod, where he and his wife Cara Mia recently settled. CCCO’s debut concert last April spotlighted the world premiere of composer-in-residence Francis Snyder’s Here at the Edge of the Sea, based on the poetry of local poet Judith Askew. Sunday’s “Summer Celebration” was its second pre-season concert. Scinto said, “When I began planning for our first season, I wanted to explore how the orchestra could navigate areas of music, the Cape, its people, and its stories.” Thus, he dubs CCCO’s very first season “Navigations.” The innovative four-concert lineup, beginning on September 30th, contains forgotten repertoire such as William Grant Still’s Serenade for orchestra, interspersed with familiar works by Dvořák, Haydn and Schubert. The guest artist lineup is impressive for a startup. On the orchestra’s third installment, David Dziardziel, clarinetist will solo in the Copland Clarinet Concerto; tenor Joshua Collier will sing in Britten’s rarely heard Les Illuminations in the closer. 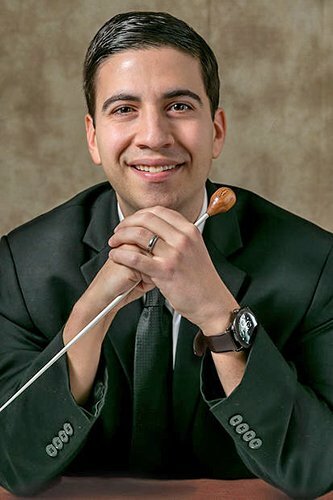 A recent graduate from Boston University’s doctoral program and a finalist for the assistant conductor position in San Antonio Symphony, Scinto has been invited two years in a row to be in a Tanglewood conducting class, and he holds the position of Assistant Conductor of the Boston Civic Symphony under Francisco Noya. This man runs on a fast track. Mozart’s Violin Concerto No.4 in D Major, K. 218 featured violinist Gabriel Lefkowitz, concertmaster of the Louisville Orchestra. His impressive bio describes not only a busy solo violin career but also his work as a film and video game composer and conductor. His very clean and assured rendition somehow lacked breath and buoyancy. Occasional pitch issues crept into the first cadenza, but overall, the execution was solid. Scinto paid close attention to every detail in the accompaniment, even in the smallest of orchestral interjections, inciting the players to a light, percolating accompaniment for Lefkowitz. After intermission, we were treated to the seldom-performed full string version of Ravel’s Introduction and Allegro originally scored for harp, flute, clarinet and string quartet. The full string version reads much more like a harp concerto, as it is sometimes classified, but in this expanded form, issues of ensemble balance and color presented occasional problems. The tempi also felt too rushed to achieve the rollicking French charm that this work requires. Harpist Charles Overton’s absolutely fabulous interpretation encompassed virtuosic flair and artistic timing. Despite the fast tempi that the orchestra continued to press, Overton managed to find space in the most unlikely places, like the spread of an arpeggiated-chord or the punctuation of descending orchestral harmonies with well-placed glissandi gestures, truly guiding the pace. He was a joy to hear. Dolores August, flute and Karen Luttik, clarinet deserve mention for a beautifully understated opening passage; so well did they blend, that it was hard to tell if it one was hearing two clarinets or two flutes. Tchaikovsky Serenade for Strings, Op. 48 concluded the concert perfectly. This four-section gem contains a signature lilting waltz that incites visions of sugar plums at times, and lyric, sometimes boisterous, Russian folk tunes interspersed with moments of tenderness and gravitas as in the beautiful third movement Elegy. Scinto led very effectively here, bringing the recurring theme back softer and more distant with each iteration, like the fading memory of a sad Russian fairytale. The final movement’s Allegro began with a hot simmering energy and rolled to a full-boil ending. An explosion of flying bows brought the audience to a fiery standing ovation as if the last chord had catapulted them out of their seats. One got the impression of a family of young artists exploring what they can do together, having just begun their very own ‘Navigations’ of their pathways as a musical family. The joyous reactions on the faces in the orchestra, the close interactions and response by both conductor and players evinced a synergy that could override any differing opinions about tempo or interpretation. The strings glowed with a beautiful warm sheen in every work, and when pressed, could also impress and excite. Without a baton and using economical Kleiber-like gestures to indicate phrasing and direction, Scinto’s conducting appeared refreshing and exuberant. At crucial moments where ensemble precision was needed, however, he could have been more concise. Tempi ran hot overall, sometimes too hot, but the players were ‘all-in’ for the ride. You can find out more about the Cape Cod Chamber Orchestra and details about upcoming concerts at www.capecodchamberorchestra.org. CCCO bears watching to be sure! Mezzo Gigi Mitchell-Velasco, a Curtis Institute of Music graduate, is currently an organist and music director in Rhode Island, where she lives with her Filipino tenor husband Noel Velasco. She has studied with Peter Sykes.